Chairs are the most common, reliable and instant sources of seating in any section of the house either indoors or outdoors. 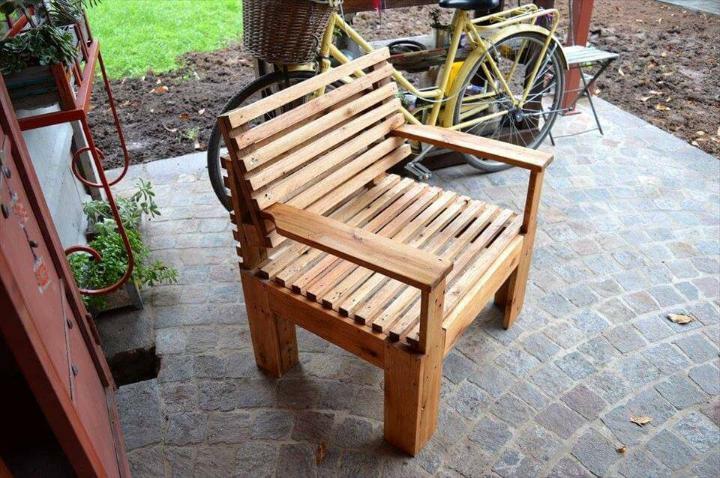 Because we need chairs for most of the tasks like dining, lounging, doing office work, reading a book or newspaper, enjoy the garden ambiance etc. and there is like an unending variety of the chair seats in the market with diverse shapes and designs to allure the customers being made up of different material like steel, metal, leather, and wood etc. 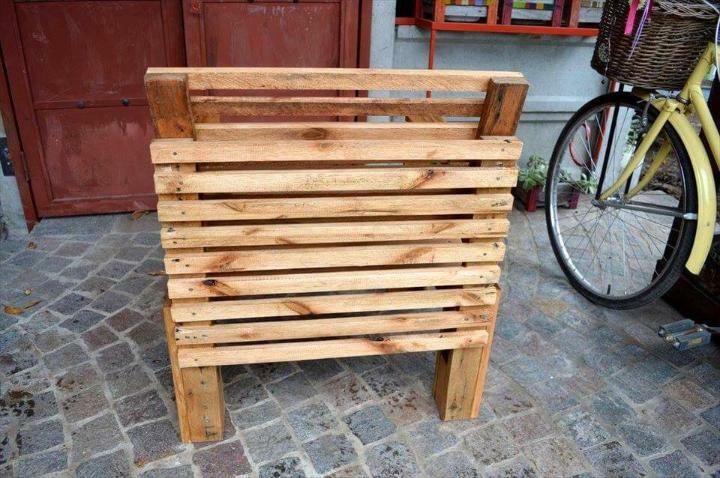 Being the prior choice of the people, wooden items are too much costly but now when a cheap wood is around you can make this DIY pallet chair of your own for a cost-free, sturdy and stylish possession. 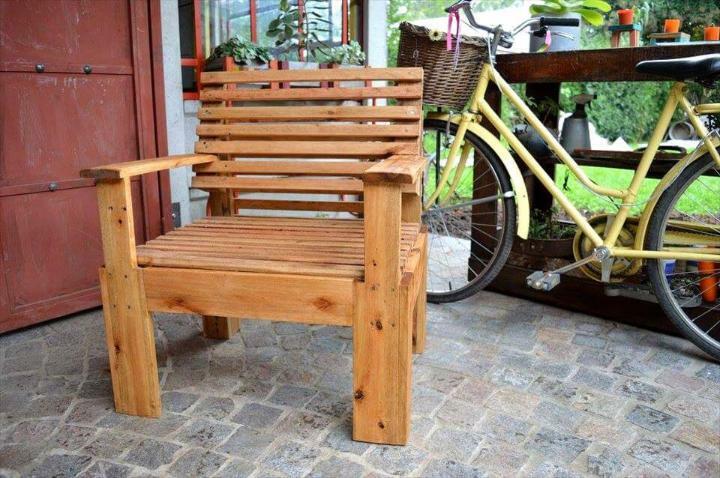 The icing on the cake is that you can shape up this chair with your own hands at home using thin pallet stripes to be stacked compactly for the seat and joined with a little a gap to form the backrest. 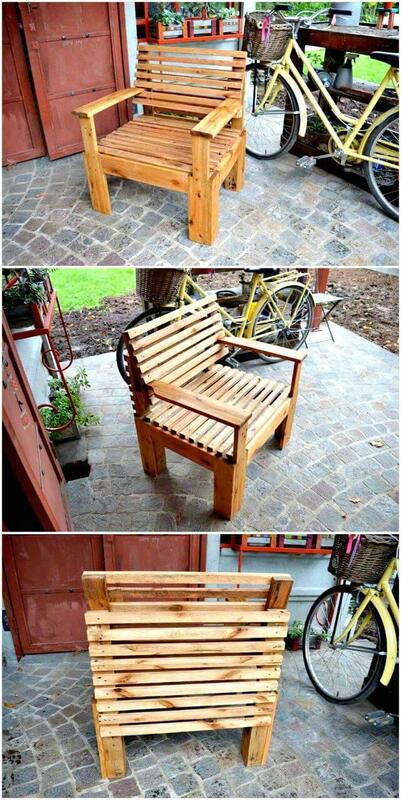 Bit thick slat pieces have been used as arms and legs with rustic brown coating all over. 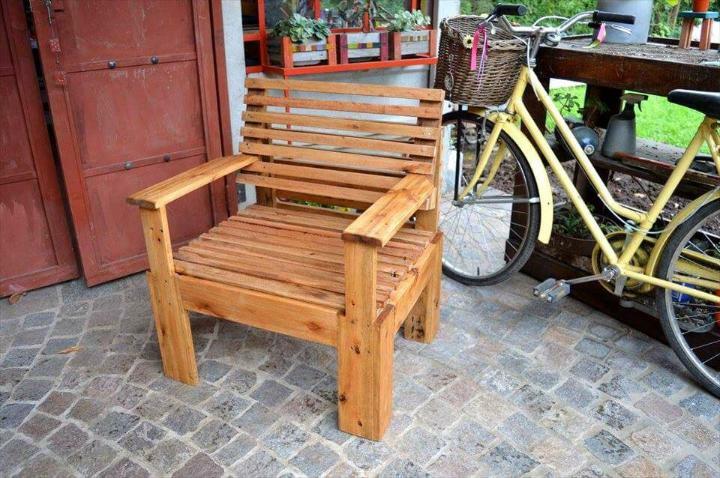 This chair has been simply and easily made from the pallets to that you can enjoy comfortable and stylish seating in any section of the house like living, balcony, your garage and even the garden or patio spaces. The chair has been endowed with all the needy and desired features of a chair like this backrest which has been made from the thin and slim pallet stripes having been nailed together with a little gap to let you rest your back on it. A bit thick and wide pallet pieces have been used to shape up the armrests and the leggy support of the chair making it look a fully featured chair to make you rest your whole body on it to let you enjoy extreme comfort. lastly, the stain task comes to give the chair a gorgeous and stylish finish which here has been done by the brown color of the paint making it look really a rustic and traditional piece to add oodles of charm to the home decor.